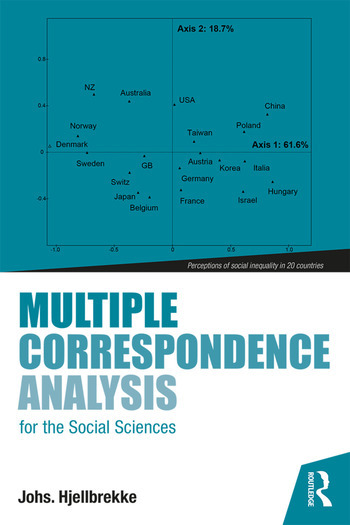 Multiple correspondence analysis (MCA) is a statistical technique that first and foremost has become known through the work of the late Pierre Bourdieu (1930–2002). This book will introduce readers to the fundamental properties, procedures and rules of interpretation of the most commonly used forms of correspondence analysis. The book is written as a non-technical introduction, intended for the advanced undergraduate level and onwards. MCA represents and models data sets as clouds of points in a multidimensional Euclidean space. The interpretation of the data is based on these clouds of points. In seven chapters, this non-technical book will provide the reader with a comprehensive introduction and the needed knowledge to do analyses on his/her own: CA, MCA, specific MCA, the integration of MCA and variance analysis, of MCA and ascending hierarchical cluster analysis and class-specific MCA on subgroups. Special attention will be given to the construction of social spaces, to the construction of typologies and to group internal oppositions. This is a book on data analysis for the social sciences rather than a book on statistics. The main emphasis is on how to apply MCA to the analysis of practical research questions. It does not require a solid understanding of statistics and/or mathematics, and provides the reader with the needed knowledge to do analyses on his/her own. Johs. Hjellbrekke is Professor of Sociology at the University of Bergen, Norway, and Director of the Norwegian University Centre in Paris, FMSH. His research interests are in social stratification, class analysis, social mobility, the sociology of elites, geometric data analysis and statistical analysis of categorical data. Since 1995, he has taught courses in multiple correspondence analysis at more than 15 different universities.